Locals love Santa Cruz Diner for its classic diner fare, which will be featured on the culinary show “Diners, Drive-ins and Dives” on Monday, November 9 at 10 p.m. on the Food Network. Photo by Alex Zamora. 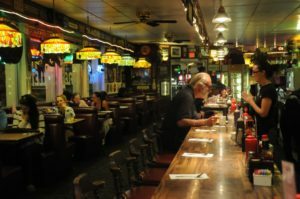 Every local night-owl and overworked college student worth their salt knows they can head to the Santa Cruz Diner for a perfect burger, stack of pancakes or just about anything else at three in the morning. With a broad menu and doors that never close, the local favorite has served many a happy Santa Cruzan since 1998 — and the beloved haunt can now add to its list of patrons Food Network’s Guy Fieri. Fieri’s “Diners, Drive-ins and Dives,” a show that tracks local culinary gems around the country, will feature the Santa Cruz Diner on an episode airing at 10 p.m. on Monday, November 9. Owners Chip and Kim Kirchner were surprised to receive the inquiry from Food Network in May. A TV-less household, the Kirchners were unfamiliar with Fieri and the show. After a lengthy phone interview with Kirchner and lots of background checks, the “Diners, Drive-ins and Dives” crew headed to Santa Cruz in June. The two days of grueling, 13-hour filming hit the diner in the peak of its summer rush. Kirchner recalled other hardships during filming, including being asked to shut off the ventilators during a kitchen scene, filling the restaurant with smoke. Although incidents like this were abnormal for diner patrons, regulars Sharon Newman and her daughter Andrea Ramos couldn’t complain. Ramos travels from Salinas twice a week to take her mother to the diner, the only place in town that prepares Newman’s usual order of banana French toast just right. This sort of local popularity gave rise to the diner’s newfound claim to fame. The Food Network show invites suggestions from diner, drive-in and dive-goers nationwide, eventually narrowing down the list and choosing a theme for the selected eateries. Episodes generally include brief interviews with patrons and staff and center around the preparation of each spot’s signature dish. Although the Santa Cruz Diner clearly made Fieri’s cut, Kirchner remained humble. Bought out of bankruptcy in 1998, the diner was the Kirchners’ vision of a real local diner in Santa Cruz. They hoped to not only reflect the diner culture of Chip’s childhood on the east coast, but also to incorporate Kim’s knack for cooking Vietnamese cuisine. According to Chip, Fieri and his crew found this harmony particularly intriguing. As for meeting Fieri himself, Chip was impressed with the platinum-coifed foodie’s cool demeanor. Although his entrance was that of a celebrity, complete with drivers and rolling garment bags, Kirchner found Fieri very approachable. Terry Nance also felt Fieri fit right in with the homey atmosphere of the diner. Taking a moment to sit down during the busy breakfast rush, Nance explained why she felt the diner was chosen for the show.